Natural Colored Diamonds: What Causes these Shades? Diamonds always look amazing, no matter what color they might be, but have you ever wondered what causes diamonds that are other colors than the white, traditional diamond to take on their color? Let’s explore the most popular colored diamonds and how they get their look with information from Minerals.net. Colored diamonds with these earthy colors have recently become all the rage for celebrities. The colors get their look due to different levels of concentrated nitrogen that combine with the carbon in the stone. 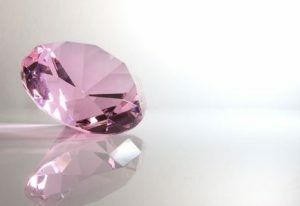 Even though yellow, brown and orange stones may be more popular right now, pink stones are much rarer and more expensive. Despite much research and numerous theories, there is still no definitive answer how these stones get their hue. One reasoning is that the stones become pink due to an excessive amount or pressure that is put on them but there is no way to know for sure. Where pink stones are very rare, red stones are the rarest of all diamonds. Also much like pink stones, there is no definite answer to how they get their color. In fact, many of the same theories of how pink stones get their color are applied to their red counterparts. Blue diamond stones hold price records because they are so highly coveted. What causes them to become different shades of blue? Varying levels of carbon and boron combine within the diamond found and create this distinctive hue. Ranging in shades from mint to deep green, verdant diamonds get their color in a unique way. They are the result of natural gamma radiation they are exposed to. Stones that receive more gamma radiation become darker green, creating emerald-like shades. Whether you’re looking to purchase one of these colored diamonds or want to sell the ones you have, Frank Pollak & Sons can help. Located in New York City, we specialize in jewelry liquidation and carry a vast selection of modern and vintage jewelry for sale. For more information, feel free to call us today at 800-342-3878! ← Fall Fashion – What’s Hot in Jewelry this Autumn?